Heading off to the airport this morning at 5:18 a.m. I watched two bright lights in the southwest sky moving to the southeast. The front light was orangish and the rear one yellow. They were moving faster than planes normally do which is when I realized the pair were meteorites on the same path. Probably one meteorite that broke up as it entered the atmosphere. But they were moving slower than most meteorites that I've seen. Normally the little ones I see leave a brief streak and are gone. Not this pair. I kept thinking that if they really are meteorites, they should burn up quickly The trailing one burned out after a few more seconds and the leading one continued for a number of seconds beyond that. The proposed right-lateral fault divides the Basin & Range province from the Colorado Plateau across the extent of Arizona and Utah and well into Canada. Bob's previous alternative tectonic theories have drawn a lot of attention and animated discussion. This one is going to do the same. 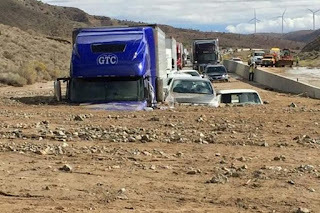 Yesterday's mudslide (actually debris flows) on Interstate 5 in southern California were a result of a huge El Nino storm over grounds laid bare by intense wildfires and hardened to runoff by drought. 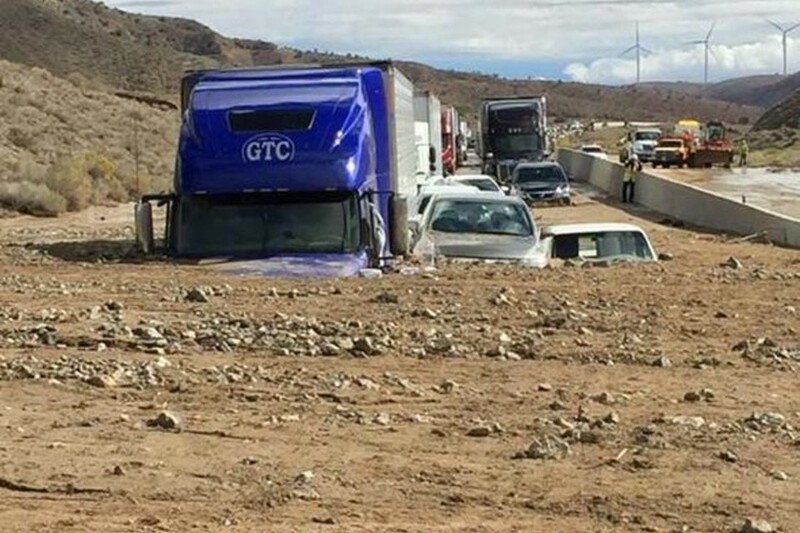 California agencies have been warning of debris flows from burned areas for several months. On Wedesday, Cal Fire warned that they had identified 133 'mudslide danger zones' in northern California, most associated with the Valley fire in Lake and Amador counties. AZGS has posted online for free viewing and downloading "The Geology of Northern Arizona - With Notes on Archaeology and Paleoclimate" at http://tinyurl.com/GeoNAZ-1974. This is a two volumes set comprising 800 pages of illustrated field trip guides for sites in Northern Arizona that was published in 1974 as part of the Rocky Mountain section meeting of the Geological Society of America. For the first time it is available online as downloadable PDF. Northern Arizona has attracted pioneers in North American geology since the days of John Wesley Powell; when northern Arizona was considered to be a part of our "last frontier." Perhaps Powell, Darton, Dutton, Walcott, Noble, Gregory, Gilbert, Davis, or Robinson would not have been surprised to learn that the geology of northern Arizona would play an important part several generations later in the geologic exploration of a new frontier--that of space. AZGS thanks GSA, the Museum of Northern Arizona, and Northern Arizona University for graciously providing permission to put this online. The two volume set was scanned and processed by Kevin Horstman. Thanks Kevin! In a news interview, Rep. Grijalva admitted the bill has no chance of passage in the House and likely won't even get a hearing but he hopes President Obama will intervene and use the Antiquities Act to declare a national monument without requiring congressional approval. 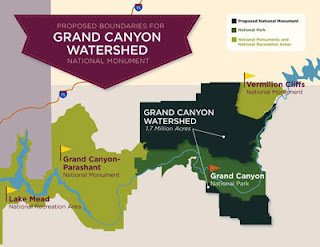 The land proposal had previously been called the Grand Canyon Watershed National Monument. Northern Arizona hosts a huge uranium resource, mostly in breccia pipe deposits. A recent study by AZGS found that the number of breccia pipes and consequent uranium resources are likely to be at least 10 times greater than previous studies. A report released last week by the US Dept. 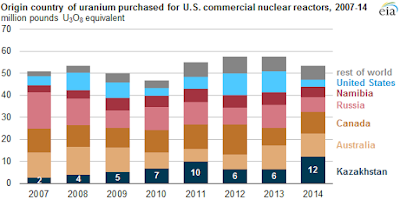 of Energy's Energy Information Administration revealed that US nuclear energy producers doubled the amount of uranium they bought from Kazahkstan last year, while US sources dropped dramatically. Dr. Phil Pearthree and Dr. Mike Conway at AZGS describe the Santa Rita Fault below the western flank of the Santa Rita Mountains, south of Tucson, Arizona in this short documentary film posted on YouTube. This active fault system is capable of producing a magnitude 6.5 earthquake. 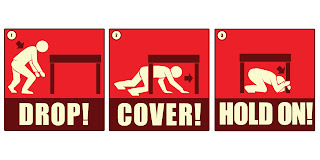 The Great Arizona ShakeOut ‘Drop, cover, and hold on’ exercise is scheduled for this Thursday, October 15 at 10:15 a.m.
Get your families and co-workers to take a minute to find the spot where you will duck, cover, and hold on in the event of a damaging earthquake. More than 74,000 Arizonans have formally signed up and many more will participate. 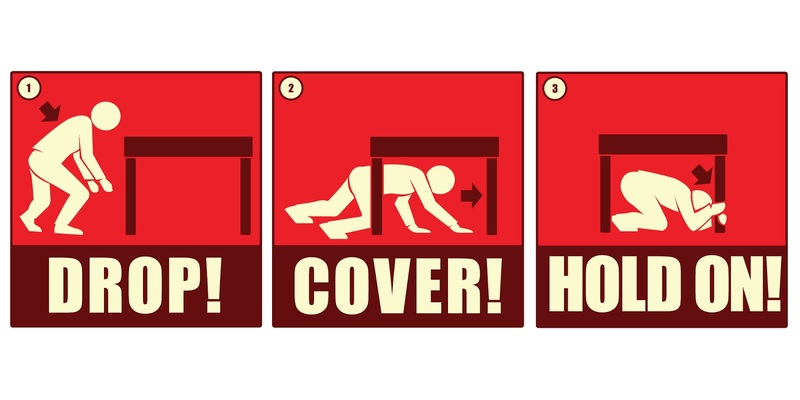 Over 41 million people are participating worldwide in the safety exercise. The Arizona Geological Survey along with along with the Arizona Dept. of Emergency and Military Affairs and and the County Emergency Managers are organizing the annual event in Arizona. The USGS is making data available for sample locations and sampling parameters from the EPA Gold King Mine spill. We are adding it to the GKM spill sample map we create. They will be releasing the water chemistry data shortly at their own dedicated GKM spill site, or it can be harvested from the NWIS web site. The USGS is building out a web feature and they would be delighted for feedback. It is unclear when they will go public. It in expected to be a very robust site with historic data, interactive map, remote sensing data – satellite and airborne, and more. They are very interested in stakeholder response to this approach. We have also received a request from the National Park Service to add biological sample data to the AZGS site so we are contacting the appropriate agencies. Join us for special science-related activities for students age five and up, families, educators and anyone interested in exploring Earth and space alongside real scientists. Explore ISTB 4's Gallery of Scientific Exploration with its variety of interactive exhibits and enjoy a 3-D astronomy show in the Marston Exploration Theater. Visitors can also see a replica of Curiosity rover, explore Tempe Butte on a guided field trip, pan for gold, dig for meteorites, bring rock samples for Dr. Rock to examine and so much more!